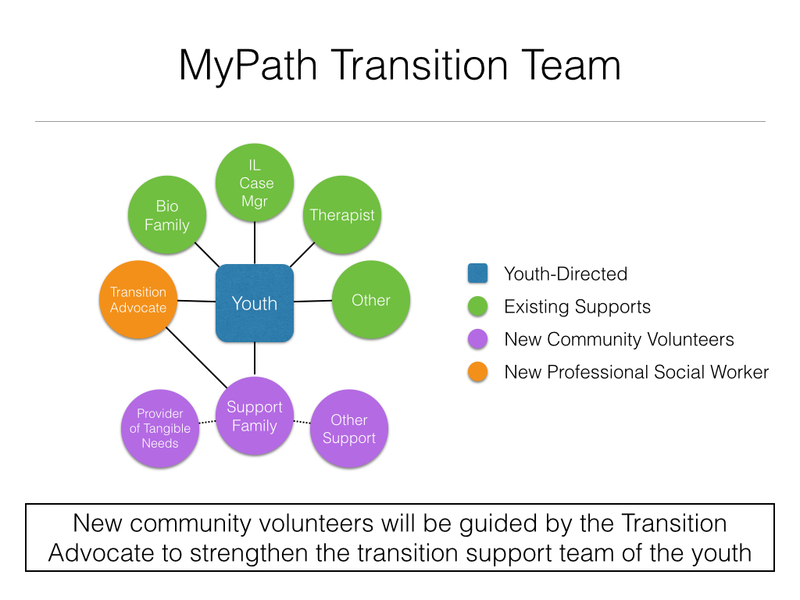 One of the most distinctive elements of the MyPath program is the intentionality that is placed on designing and developing the Transition Team. In keeping with our youth empowerment model, this team will be youth-directed. 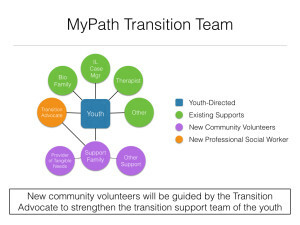 A critical component of the MyPath Transition Team is the role of the Support Family. These community volunteers will supplement and strengthen the youth’s existing supportive relationships by serving in a mentoring-like role. Unlike many mentoring relationships, the Support Family will be advised to avoid being directive in their coaching, but focusing instead on developing a youth-adult partnership of mutual learning. The Support Family will be guided to take a posture of encouraging and supporting the young adult as they learn to take ownership and responsibility of their own goals and decisions. The role of Support Family is not limited to married and single parents with children. Any adult at least 21 years old can volunteer to serve as Support Family for the youth in our program. Their primary role is to commit to a family-like relationship of caring, encouragement and supportive coaching. The Youthrive Transition Advocate is a trained social work professional that will be dedicated to working with the youth and the Transition Team. In addition to helping the young person build an effective team, the Transition Advocate will also serve as an ongoing support to our Support Families.